Adequate and evenly distributed land supply is fundamental in ensuring the social and economic future of SA. Monitoring land supply and development activity today helps to increase housing accessibility and affordability tomorrow. other summary information including; median lot size, share of infill versus greenfield development. The report is published six-monthly to coincide with the availability of data for the end of calendar and financial years. Allotments created from land division applications can be viewed in the Location SA Map Viewer or downloaded as a spatial layer from Data.SA. You can receive notification of the release of new reports by sending an email to DPTI.PDPlanningInformation@sa.gov.au. The Residential Broadhectare Land Supply report provides information about the amount, ownership and distribution of broadhectare land in residential zones of the Greater Adelaide region and selected rural townships. Residential broadhectare land can be viewed in the Location SA Map Viewer or downloaded as a spatial layer from Data.SA. Minor infill refers to sites less than 4,000m2 involving the permanent removal of a dwelling (demolition), or resubdivision of a parcel to create an additional allotment/s with the original dwelling retained (resubdivision). It is estimated that minor infill represents around one-third of the total dwelling stock growth in metropolitan Adelaide each year. The housing and employment land supply program guides the effective management of land supply in South Australia for residential, commercial and industrial purposes. provides a spatial guide to local government to help align regional implementation strategies. The report also identifies actions that state and local governments can take over a five-year period to implement planning policies and ensure that land supply meets demand and the necessary infrastructure can be provided. 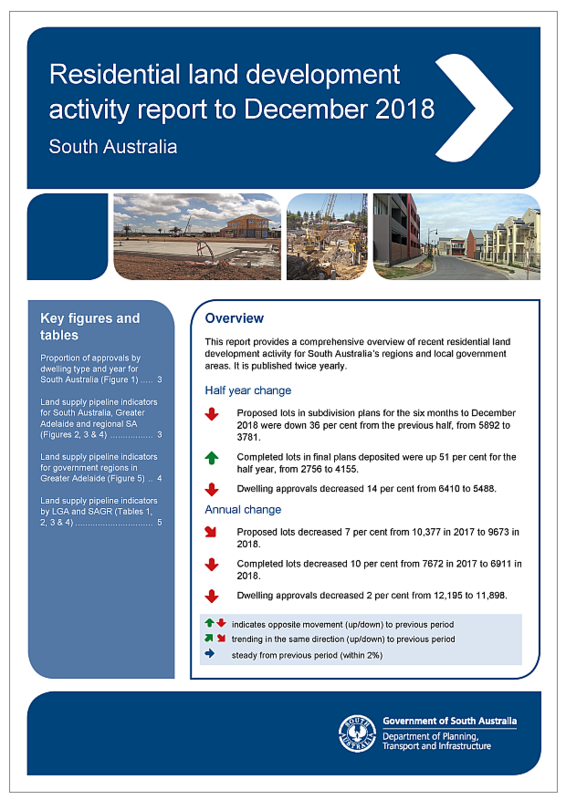 For more information about land supply monitoring email DPTI.PDPlanningInformation@sa.gov.au.